(Nanowerk News) For the first time, spontaneous insertion of carbon nanotubes (CNTs) into natural as well as synthetic cell membranes to form pores that mimic biological channels has been demonstrated (Nature, "Stochastic transport through carbon nanotubes in lipid bilayers and live cell membranes"). Despite their extremely simple structure, these CNT-membrane pores replicate the major functional behaviors of porins (protein-based biological channels), such as selective transport of protons, water, ions, and small molecules. The predictive design and creation of robust synthetic membranes that replicate the highly efficient and selective transport processes of biological channels is a challenging goal. CNT porins developed here are promising biomimetic platforms for nanofluidic studies, building bioelectronic interfaces and synthetic cells, and serving as key components for energy-efficient membrane-based separation systems. Depiction of carbon nanotube (gray) inserted into a cell membrane, with a single strand of DNA (gold) passing through the nanotube. Summary For the first time, a process for spontaneously inserting carbon nanotubes (CNTs) into cell membranes, both natural as well as synthetic, to form pores that mimic biological channels has been demonstrated. Robust, synthetic membranes that replicate the highly efficient and selective transport processes of biological channels are much sought-after but have not been realized yet. CNTs are thought to be the best candidates for mimicking biological transport because of the similarity of their inner pore structure to that of major biological channels and the possibility that, based on computational modeling, the CNTs could self-insert into biological membranes. However, creation of such hybrid membrane structures has remained an outstanding challenge. Now, a team led by scientists at Lawrence Livermore National Laboratory and including scientists from Lawrence Berkeley National Laboratory, the University of California at Berkeley, and the University of Basque Country in Spain has formed a hybrid membrane by creating membrane channels from short CNTs. They found that CNTs functionalized with lipid (fatty) molecules spontaneously insert into cell membranes, both natural and synthetic. Importantly, insertion of the small CNTs into live cell walls allowed them to interface directly with a real biological system, something not possible with long CNTs. 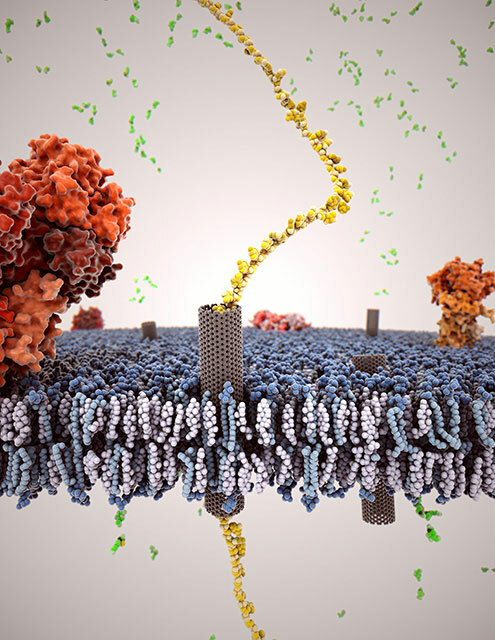 This interface permitted the fundamental physics of nanopore transport to be investigated using a model that more closely approximated an ion channel and that mimics transport in biological pores. Despite their extremely simple structure, these membrane pores reproduce the major functional behavior of biological channels, such as selective transport of protons, water, ions, and small molecules. The CNTs do not affect the integrity of the membrane. Electron microscopy revealed that insertion is not selective to a particular nanotube length. Furthermore, a near-perpendicular orientation of the CNTs within the membrane is strongly preferred, contrary to previous simulation-based predictions. Despite significant CNT length variations, the transport properties of these hybrid membranes, termed “CNT porins” (where the term porins refers to protein-based biological channels), are extremely well defined, strongly suggesting that transport through the CNT pores is directed only by the barriers at the pore exit and entry. In addition, nanoscale confinement of ions in the narrow hydrophobic channel gives rise to ionic current fluctuation, mimicking the on-off gating process of ion transport that occurs in biological channels. Cumulatively, these results point to the hybrid materials having useful membrane applications. These applications include providing a platform for nanofluidic studies, building bioelectronic interfaces and artificial cells, and serving as key components for energy-efficient membrane separation systems.